It’s always a great pleasure to discover new eateries, especially when they are homestyle restaurants that one can enjoy on daily basis. Comfort food always makes me feel good. Dishes that can make me think of yester years are often dishes that taste the best. This round, a new See Fong Choy opens in the heart of Seri Kembangan at Taman Equine at Bandar Putra Permai. Leng Loong Seafood Restaurant brings a taste of Kong Xi cuisine to the city. I got to know of Leng Loong Seafood Restaurant from one of the owner Ryan who also happens to own several other eateries. He was excited about this latest venture of Leng Loong Seafood Restaurant together with the chef of Leng Loong. Leng Loong’s chef hails from the town of Lenggong, Perak. The humble chef has been whipping up loads of Kong Xi dishes from his heritage and has also mastered other cuisines as well. Both wanted to bring a taste of Kong Xi See Fong Choy dishes from Lenggong to foodies and that is how Leng Loong Seafood Restaurant was born. Staying true to the Kong Xi roots, Leng Loong serves up signature dishes using special ingredients like Lenggong homemade noodles, Lenggong chili sauce and more. We went during a Sunday lunch and were treated to a list of humble and delicious Kong Xi dishes. Since we had our kids with us, the chef whipped up his Golden Sand Fried Rice for them. I am not kidding, the fried rice is utterly aromatic and delicious. So much so, the adults kept stealing spoonful after spoonful of the eggy fried rice. There were bits of prawns and lap Cheong that was really enjoyable and the rice was fluffy and eggy, just the way many of us loved it! Lenggong has its own noodles and Leng Loong has gone to miles to bring this into the restaurant. The chef personally makes trips to Lenggong to replenish the noodles for his signature Leng Loong Homemade Noodle. The noodles are fairly thin and have a good firm bite. The noodles are also alkaline-free. Chef whipped up these noodles with prawns, pork and vegetable in a dark brown sauce and crowns them with lardons of pleasure. Next up, Leng Loong Kong Xi Claypot Fish is a popular dish in the town. The method is to literally steam-baked the fish in the claypot with sauce till it is fully aromatic and cooked. This one has shredded ginger and garlic with some coriander as a finishing. The tilapia is pretty decent and sweet. Kong Xi Tau Pok is and will always be one of my favorite foods to enjoy. This typical Kong Xi dish uses certain meaty and soft tau pok, often similar to those from Bentong. These are stuffed with a filling of minced pork and chives and cooked in broth. Each bite has juices filling my mouth with delight. The tau pok is soft and the filling is very flavourful. I can easily eat quite a few of these Kong Xi tau pok myself. The next dish also came in a claypot. Kong Xi Rice Wine Claypot Chicken uses Fa Tiew wine to create its signature aroma and flavour. The dish has chicken chunks sautéed with ginger in the dark savory and sticky sauce before being laced with loads of Chinese rice wine and crowned with coriander. Make sure to savor the dish hot for maximum flavours. The claypot also helps to keep this dish warm. I could eat bowls of rice with this dish alone. This dish is perfect for anyone of all ages and is pure comfort food at it’s best. Kong Xi Fried Pork is also another favorite at the table as these were literally gone in minutes. Boneless pork chop is well marinated with Nam Yue fermented beancurd and other seasoning. The seasoning is robust and moreish. The pork is very crispy with a tender meat. They also make good snacks with beer so one plate of this Kong Xi Fried Pork may not be enough if you are an ardent fan of hog just like me. I like how rustic the Golden Salted Egg Prawn is. Normally, the prawns are usually coated in a smoother salted egg yolk sauce but chef kept this rough and sandy for extra flavours and textures. Coupled with curry leaves, chili padi and other fragrant bits of ingredients, the Golden Salted Egg Prawns is very sinful and scrumptious. I kept scrapping for that salted egg mixture to go with my rice. I have long concluded that any ingredients when paired with salted egg will always be a favorite dish of mine. Must-order at Leng Loong! When the Asam Steamed Talapia arrived, we all couldn’t help but to smile at the fish’s mouth. Though this dish is pretty much available here, this version is still a good one well executed. The gravy is decently tangy, spicy and savory with lots of long beans, eggplant, onion and tomato pieces. My only gripe is that the sauce is a bit too thin but flavours are still decent. Although soups are usually a beginning dish to start each meal, ours ended with it. Old Cucumber Boiled Soup is rather delicate and a pleasing dish to end a meal of so many dishes and to sooth our tummies. We also had a Chilled Dessert of ‘Nai Tung’. Its milk and cream set with gelatin. The ending is simple and sweet. For this festive season, Leng Loong is also offering Chinese banquet course set menus priced at RM398 or RM588 for a table of 10 person. Enjoy Yee Sang with various dishes this festive season with reservations in advance. 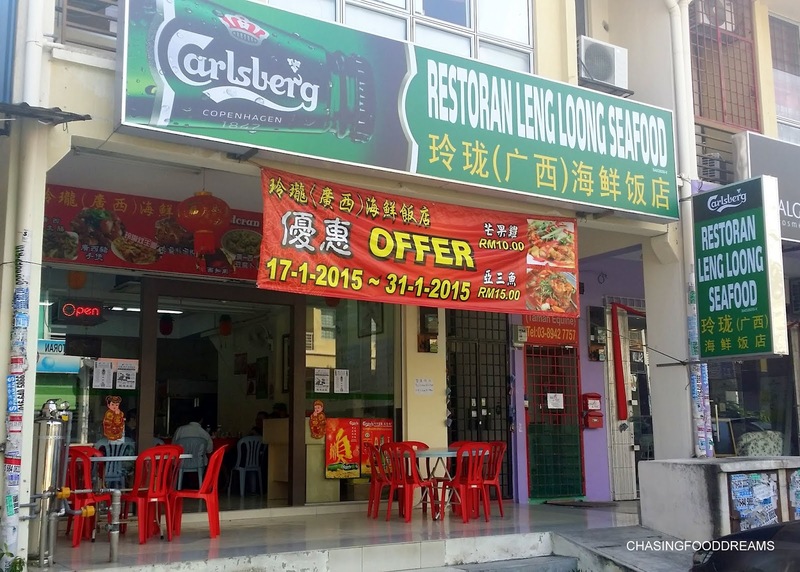 Leng Loong Seafood Restaurant is your perfect neighborhood restaurant. Diners can expect simple homestyle dishes that can be enjoyed on its own or with rice. Prices are affordable for daily visits. Highlights of this restaurant include Leng Loong Homemade Noodles, Kong Xi Tau Pok, Kong Xi Rice Wine Claypot Chicken, Kong Xi Fried Pork and Golden Salted Egg Prawn. The fried pork a bit too fat for my liking but the give me the sambal petai anytime and I'll polish it off effortlessly! Can't say enough great things about Boston restaurants! Our server was productive and nice. The appetizers were excellent, as were the main courses. The food is indeed as good as advertised and they had some solid beer recommendations. I can't wait to come back!